We are among the most trusted organizations, engaged in manufacturing, supplying and exporting Universal Pilot Scale Centrifuge. Sturdily built, this product is stringently checked by expert quality controllers on certain well-define parameters to ensure flawlessness. Moreover, our R&D experts help us in conducting regular researches for improvising our Universal Pilot Scale Centrifuge. • Variable basket speed: Max 200 rpm, G-Force : 666 (max). • Capacity : 7 lit. / 10kg. • Trolley-mounted. can be used on any storey. • Filter Area : 0.235 SQ. mt. upto 0.565 sq. mt. • Most Suitable For Biotechology Products. • Variable basket speed: maximum 2000 RPM. • Trolley mounted for easy loading and unloading. 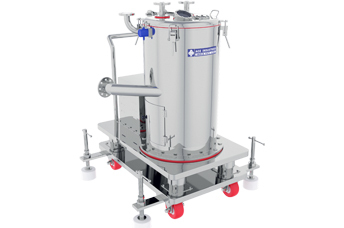 • Suitable for biotechnology products. • Filter Area: 0.235 sq. mt. upto 0.565 sq. mt. • Capacity: 7 lit. / 10 kg.